This newest, and the second-to-last installment in the film exploits of Harry Potter has met with an array of mixed reviews. Detractors cite the film's slow pace, meager plot, and lack of full resolution, while the people who love it seem to do so primarily out of affection for the book/film series. Praise also seems to heap most fully in the form of appreciation for the aforementioned slow pace, artful brooding and brilliant cinematography. I, for my love of the books and the previous films (at least Order of the Phoenix through now), fall in the praising category primarily because of the incredible effort and vision to bring this opening half of Harry Potter and the Deathly Hallows to the screen at all. Director David Yates accomplishes a lot by merely condensing the laborious first half of the text, and keeping it interesting to as an artifact of the phenomenon, rather than a phenomenon unto itself. Perhaps the greatest success of Deathly Hallows comes from the brilliant cinematography. Shooting on location throughout a wide variety of natural backdrops serves the film well as the world itself is a character. Deathly Hallows is not just about Harry Potter, Hermione Granger and Ron Weasley finding horcruxes and figuring out what the Deathly Hallows are, it's about that moment when these kids, teenagers, but not yet (wizard) high school graduates, first strike out into a world larger and more dangerous than they have ever seen before. Previous installments in the series have always been safely contained. Plots carry these characters from home to school and back home, but all of their discoveries and journeys have a safety net of sorts. With Deathly Hallows, Harry, Hermione and Ron are on their own, and one of the film's strengths is that it uses wide, distant establishing shots that place the protagonists' tiny (but magically sprawling) tent in perspective of a greater, unknown, wide world. It's a metaphor for growing up too fast, being thrust into the world and having to fend for themselves. And it was a point integral to the original text that Yates translates brilliantly. The film is slow-paced though, compared at least to other fare of a similar ilk. Yates doesn't rush to finish anything, making this installment essentially a form of prolonged foreplay. Many reviewers haven't seen it that way, and I think I understand why. Deathly Hallows relies the most heavily on an expansive knowledge of the Harry Potter series. Walking into this film expecting to know what's happening, who's who and where everything will go without a dense knowledge base just doesn't work. The characters ARE brooding and the entire installment is ill with teen angst and wanderlust, but that's the point. We already know what motivates our heroes, and we've seen enough to know where their hearts lie, so the film doesn't have as much to work with. Still, it holds well as a sort of Empire Strikes Back for the Harry Potter set. 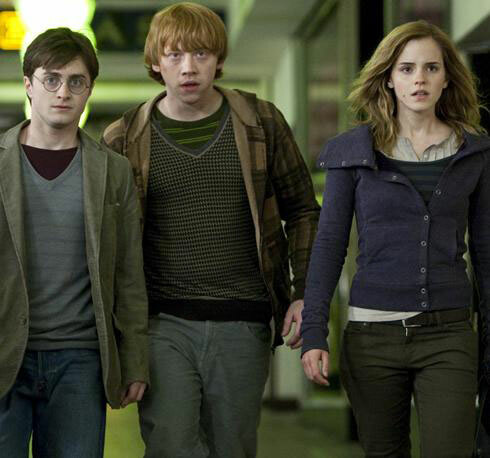 Knowledge is gained, heroes learn of some power hidden that they didn't know before, and despite traveling great distances, Harry, Ron and Hermione end up knowing that they only have themselves. They are the improvised family and they are all they need, at least for now. As for the plot, Deathly Hallows is such a densely adorned book (mostly dense in wandering, wondering and other such w's) that grinding out a two and a half hour movie that captures the high points without belaboring every scene is a lot to ask for. Yates succeeds. And it ends with a strong setup for the final half. When everything will hit the fan and the deaths are sure to become more real and more gruesome. The acting is better too, showing the age of these kids, now adults, portraying people on the precipice of adulthood, but already holding too much responsibility. As an film independent of the series, Deathly Hallows could not stand alone, but as the emotional lamentation arising from six previous adventures, it is paramount.